I can’t stop watching cars fill this little paved cul-de-sac set down in the earth with glorious, glorious tire smoke. It’s a bowl that’s been specially made for smokin’ meats. 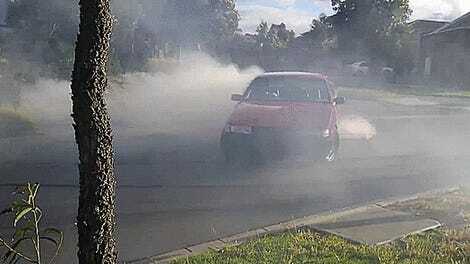 These gnarliest of burnouts come from a burnout competition at Australia’s Winter Ponde. This V8 Chrysler Valiant not only fills up the burnout pad’s pit with smoke, but it looks good doing it. It’s not just the pretty classics in on the fun, though. This more modern Holden Commodore shows up to do what Commodores do best: kill tires. This car ran into the edge of the pit, but left such a beautiful pastel pink and purple cloud in its wake that I had to include it. And of course, it’s not just cars in on the fun. Here’s a LS1-swapped Toyota Hilux proving yet again that the Hilux can go absolutely everywhere. This Commodore even says “Cops Love It” on the side. I think everyone can get behind a good burnout pit, both to give us a safe place to hoon and for the oh-so-impressive effect of filling a giant hole in the earth with tire smoke. 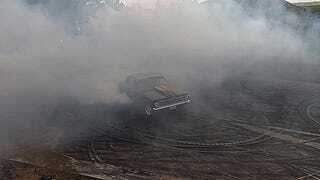 Burnouts! Burnouts are what brings us together.